I'm having issues with Synergy 2, and it seems to be on my client computer, a 64 bit Windows 10. The other computer is running the latest version of Ubuntu. I've tried using tech support but all they've done is tell me to try updating to Synergy 2 (which is all I've ever used, as I've just discovered this program in the past week). The issue is that when I start Synergy on my Windows computer it goes straight to the blue screen (screen shot below) but does not give me any "setup" options whatsoever. When I right-click, I can view the log and that's it. It's seeing my Linux based off the logs, but the Linux is disconnecting, and I can't change any settings on there, either, and the blue screen never comes up for it, meaning I can only copy/paste the log. I'm not incredibly tech savvy, but I'm pretty competent at following instructions so I feel like it must be some sort of setting on my end that I'm not aware of. I'm really frustrated with the responses I've gotten from support, and how long it takes them to respond, and was really hoping to have this all figured out and setup by this weekend because I don't have a whole lot of time to be playing with this. I'm hoping someone else knows how to solve this! These are the most recent screenshots taken, showing what the Linux log now shows. Well, that's pretty much all you are expected to see. But you should see both machines /screens displayed there. It looks like neither is seeing the cloud service. Work through the troubleshooting you find on the beta portion of the forum. Let us know how you are doing, we can go from there. 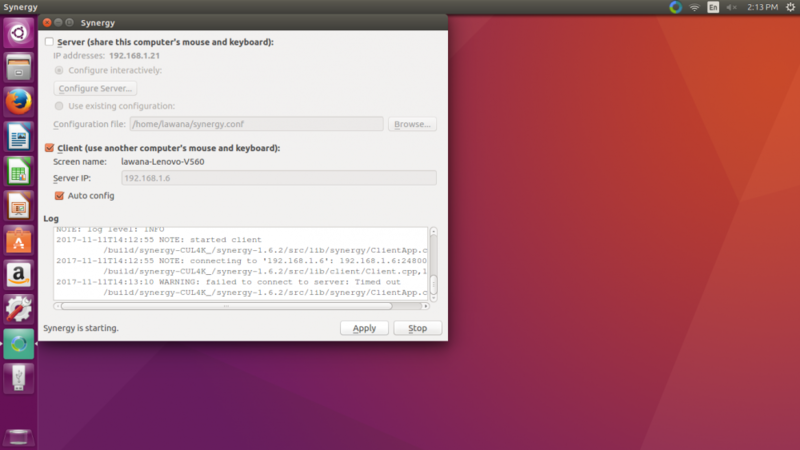 Is it version 1 or 2 runing on Ubuntu? To me it appears to be version1 but on first pic is version 2. Synergy 2 is not backwards compatible! If you're upgrading from Synergy 1, you will need to install Synergy 2 on all of your machines. It's version 2 on both computers. I've never had version 1, and the option to download anything other than 2 was never even there for me. I've never done anything to set up the client computer, from the very first time I opened it on my Windows computer it went straight to that blue screen and has never shown anything else. I've never made it the client and there's no way to see any of the settings. This is actually version 1. When Ubuntu asks "Do you want to install an older version?" you must ignore this.